#For Principal: Candidates must have acquired PG in any subject and B.Ed. #For PRT (Telugu): Candidates must have acquired Graduation in/with Telugu with at least 55% marks in Telugu and B.Ed./ Pandit training. #For PRT (Hindi): Candidates must have acquired Graduation in/with Hindi with at least 55% marks in Hindi and B.Ed. #For PRT: Candidates must have acquired 60% marks in Central/ State level Teacher Eligibility Test, Graduation with at least 55% aggregate marks and B. Ed. #For Music Teacher: Candidates must have acquired Graduation or 3 years Diploma in Vocal Music from a recognized university/ institution. #For Health wellness Teacher/ Counselor: Candidates must have acquired PG in Psychology/ Child Development or PG Diploma in career guidance and counseling. 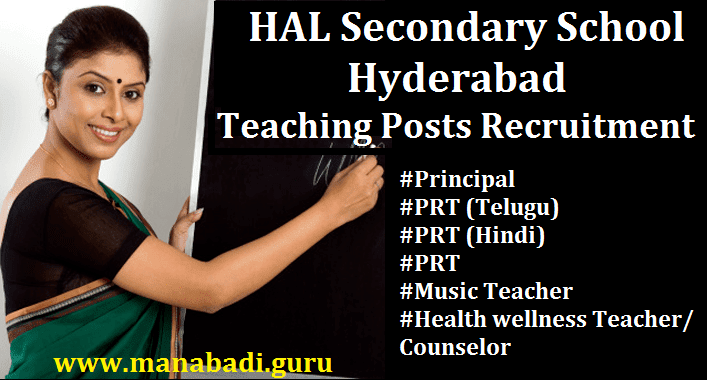 Candidates age should be 55 years for Principal post, 40 years for PRT (Telugu), PRT (Hindi), PRT, Music Teacher, Health wellness Teacher/ Counselor posts as on 31-03 2017. Eligible and Interested candidates may send their applications in the attached format, along with one self addressed envelope and photo copies of certificates in support of claim regarding their age, educational qualification, experience, etc. so as to reach The Principal, H.A.L. Secondary School, H.A.L. Township, Balanagar, Hyderabad-500042. Short listed candidates will be called for written test, demonstration and personal interview. #Fluency in English for all the posts is mandatory. #Age, qualification and other eligibility criteria are to be reckoned as on 31.03.2017. #Only Indian Nationals need apply. submission of application will not entail right for claiming employment. #HAL Management reserves the right to fill-up or not to fill-up any or all the notified posts. HAL also reserves the right to cancel the advertisement and / or the selection process there under. #Applications not having the required details or those received after last date will not be considered. School is not responsible for any postal delay. No correspondence in this regard will be entertained. #Canvassing in any form will disqualify the candidates. Committee, a Registered Society and not that of HAL Divisions. #Management reserves the right to increase or decrease the number of posts or cancel the post(s). Last Date for Receipt of Application: 31-05-2017 at 5:00 pm.